Another product that comes from General Motors’ division Chevrolet is light-duty full-size pickup truck Chevrolet Silverado 1500. This pickup takes more traditional truck approach than its direct rival Ford F-150 and it also goes against rivals like Ram 1500, Toyota Tundra, Nissan Titan and its mechanical twin the GMC Sierra 1500. The last substantial redesign for this model was for 2014 model year when GM introduced new look, more refined and quieter interiors but also has added more frugal and stronger engine lineup. Of course, according to modern trends trucks have also received a set of modern technology and safety features. 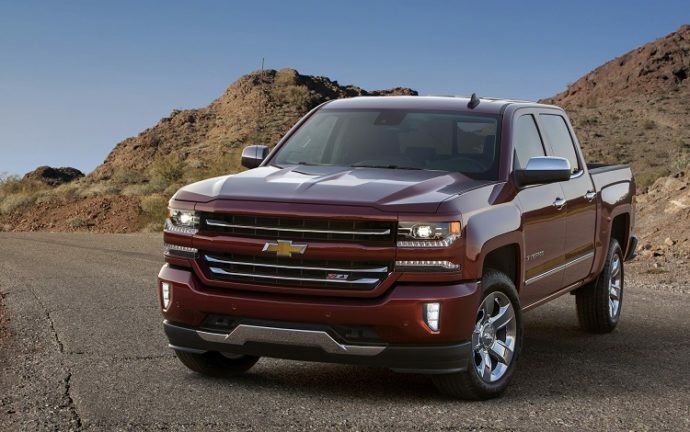 In the 2015 model year, Silverado 1500 entered with a few updates including new transmission, upgraded OnStar connectivity, it also added Black Out package for work versions and new 20 inch wheels. For 2016, Chevy responded on Ford’s F-150 redesign with refreshed front end that added new grille designs and Led lights and it also upgraded infotainment system with new interface technologies. Then expanded safety rig with lane departure intervention and since then an eight speed transmission has been available with 5.3 liter engine. The upcoming model year will present 2017 Chevy Silverado 1500 model with limited changes that include new color options, some equipment regrouping while on the performance front it will essentially continue unchanged despite some rumors suggested new diesel engine option. As things now stand, the Chevrolet won’t change approach when it comes to powertrains. Unlike the top-selling F-150, it won’t go with engine downsizing and turbocharging and instead it will stick with traditional, large displacements. There won’t be rumored diesel engine either and we will again choose between V-6 and pair of V-8 engines. All engines are from EcoTec3 family and therefore feature cylinder deactivation, variable valve timing and direct injection. They also comprise aluminum heads and blocks. Chevy hasn’t announced some power and torque upturns but it hasn’t been excluded either. So, the most of 2017 Chevy Silverado 1500 will come standard with a 4.3 liter V-6 that will produce around 285 hp and torque of 305 pound-feet. A six-speed automatic will likely be mandatory with this engine while both rear-wheel and all-wheel drive will be available with this combination. More power and torque will be available from the 5.3 liter V-8 that will be standard on higher trims and optional on others. It will raise output on around 355 hp and 383 lb-ft of torque. It will be available with either six-speed or eight-speed automatic transmissions as well as with rear- and all-wheel drive. The most torque and power and consequently the highest towing and hauling capabilities will be provided from the 6.2 liter V-8 which can make around 420 hp and 460 lb-ft of twisting. As for fuel economy, V-6 powertrain will return around 20 mpg in both configurations. Smaller V-8 will follow with 19 mpg average while 6.2 liter based configuration should sit around 18 mpg combined. Expected towing ratings will be around 7,600 pounds with the V-6 engine, around 11, 100 units with a 5.3 liter V-8 and the most powerful V-8 will allow up to 12, 000 pounds. What is also important, new Chevy’s truck will provide well-composed ride and handling probably one of the best among all full-size models. It comes from stiffer front coils springs, rear leaf springs and twin-tube shocks at all corners. All models will also include well-weighted electric power steering and all-wheel disk brakes. It isn’t something unexpected that new 2017 Chevy Silverado 1500 won’t showcase some exterior changes considering 2014 year complete redesign and last model year front-end restyle. All Silverado 1500 versions will offer distinctive grille designs which will combine chromed or body-colored center bar and surrounds with mesh or radiator openings. Higher trims will feature more bright work and lower trims will come with HID headlights and LED signature lighting while higher trims will offer LED based lights. Models will also feature nicely sculpted hoods and squared off fenders which will give it bolder appearance and wheel sizes will vary from 17 to 22 inches. Two new colors will be available including graphite Metallic and Pepperdust Metallic. Behind the steering wheel, new models will be roomy, function and quiet. All versions will include high-quality materials and built quality is also impressive. Depending on the trim, models will come with bench or bucket seats and they will be available with heating, ventilation and adaptable lumbar. The dash will feature upright design with easy to use controls and instrument panel will feature easy to read gauges. Many buyers will also appreciate multiple in-cab storage compartments. What is also important, infotainment interface is easy to use and understand with responsive voice commands and support for apple Car Play and Android Auto. This model will come in regular two-door cab configuration and also in four-door double and crew cab formations. Regular Cab models go with standard 6 foot 6 inches or 8 foot bed lengths. A 6’6”bed box will be standard on Double Cab models while the most comfortable Crew Cabs will offer 6’6” and 5’8” bed lengths. The Chevy will likely use the same strategy for trims and there will be WT, LS and LT equipment groups for Regular Cab models. Double Cabs will be available with all of mentioned with addition of LTZ trim. All the aforementioned grades will be available with Crew Cab models and added to the list is top-of the line High Country trim. There will also be packages like off-road oriented Z71 package on some versions. Some, changes and regrouping will certainly be made across trims and full list of features on each trim will be available closer to model’s release. However, all models will offer air conditioning and keyless entry. Upgraded Mylink infotainment system will be available with 7-inch touch screen on lower end versions while top trim models will include 8-inch screen units and premium Bose sound system. OnStar with 4G LTE and WiFi hotspot, Siri Eyes Free, smartphone compatibility will also be available. Dual zone climate control, heated steering wheel and seats, eight-way power adjustable seats with four-way power lumbar, and much more will also be available. Some models will also allow to be configured with off-road hardware. The safety equipment will include rearview camera, parking sensors but also driver aids like forward collision warning and lave departure warning. The new 2017 Chevy Silverado 1500, despite limited upgrades for upcoming model year, will remain a solid choice in its class. The pricing of this model hasn’t been announced but big changes aren’t expected in that context. The model will go on sale late this year.